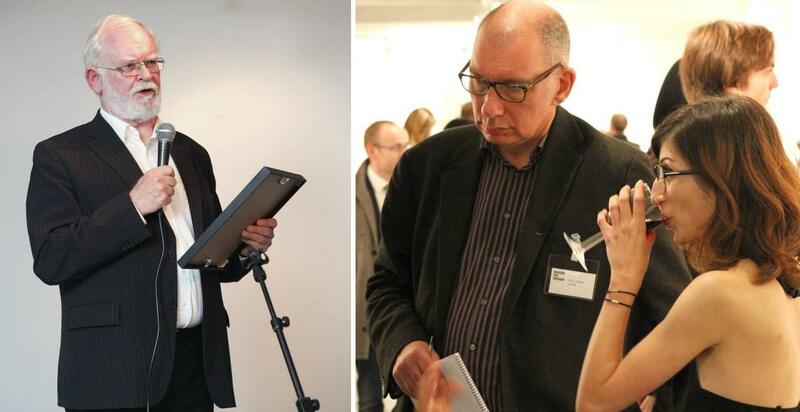 A leading Birmingham criminologist was bombarded with vicious hate mail and violent threats just days after publishing his research into online Islamophobia. One internet troll even accused Imran Awan, of Birmingham City University, of being worse than members of the barbaric jihadist group Islamic State. 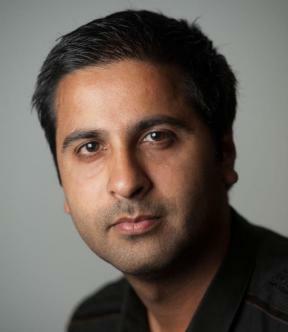 Mr Awan said he was shocked by the sheer number of “vitriolic hate-filled” messages he received after an online discussion about his detailed research on anti-Muslim abuse on the internet. He revealed how he received anonymous threats and how one far-right website had even put him “under official investigation” – labelling him a “troublemaker”. Mr Awan said: “My research attempted to show how hate groups on the internet, especially Twitter, were using this space to intimidate, cause fear and make direct threats against Muslim communities. That has particularly been the case since the murder of Drummer Lee Rigby in Woolwich last year. This appeared yesterday on the Facebook page of far-right group Britain First. As you can see, the post has now been shared nearly twenty thousand times. The picture may look familiar. That is because it is a well-known far-right fraud that has been circulating around the internet in various forms for several years now. Its claims are almost entirely inaccurate. 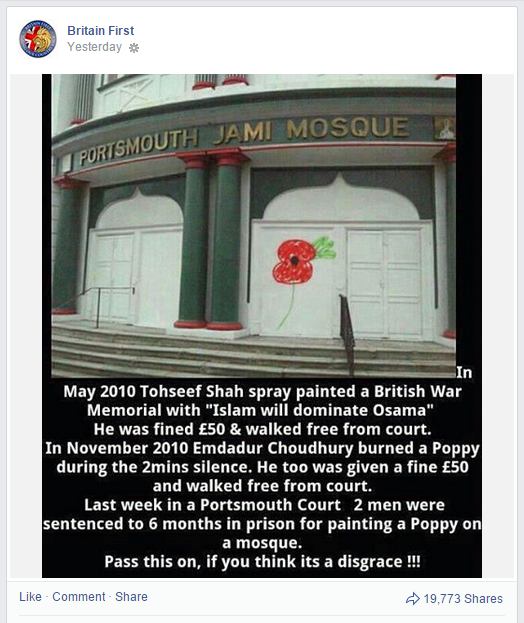 Tohseef Shah, who sprayed the words “Islam will dominate the world – Osama is on his way” and “Kill Gordon Brown” across the plinth of a war memorial in Burton upon Trent in May 2010, was not in fact fined £50. Having been convicted of criminal damage, he was ordered to pay £500 in compensation as well as £85 costs. There were complaints that he hadn’t been charged with a racially or religiously aggravated offence, which would have carried a heavier penalty, but the CPS had decided against that on the grounds that the offence was politically motivated and “no racial or religious group can be shown to have been targeted”. CBC News interviews Imran Awan, deputy director of the Centre for Applied Criminology at Birmingham City University, and Fiyaz Mughal of Tell MAMA on the rise of anti-Muslim hatred on the internet. The far right is taking advantage of legal loopholes, notably the absence of an effective law against incitement to religious hatred, and reluctance by the authorities to take action against hate speech on social media, in order to target the Muslim community. CBC also spoke to “Simon North” of the English Defence League who brazenly denies his organisation’s role in inciting anti-Muslim hatred online, claiming that “some Islamophobic messages might emanate from the group’s regional divisions. But they do not reflect the group’s overall thinking”. Mr Robinson’s defence of the right of preachers to “denounce false doctrine” was politically inept, to put it mildly, and it showed a peculiar understanding of the role of a secular politician. But in a narrow way he is right. Under any legal regime which upholds free speech, so long as it does not advocate violence, preachers (including Islamic ones) do have the legal right to denounce beliefs that they regard as false. 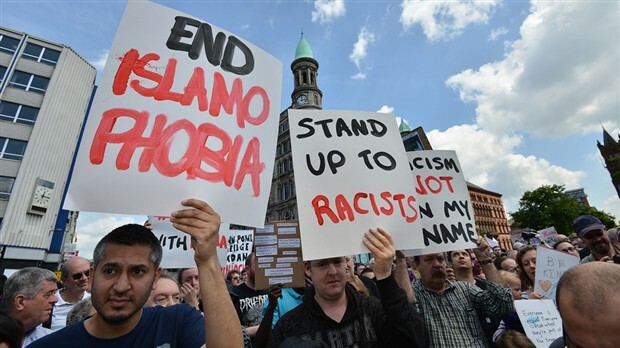 There were hard discussions about this when Britain introduced legislation on “religious hatred” in the wake of the 2005 London bombings; and to the relief of free-speech advocates, language which would virtually have prohibited robust religious debate was struck out. Police have launched a probe into a a potential hate crime after an outspoken evangelical pastor defended describing the Islamic faith as “satanic” and a “doctrine spawned in hell”. Senior Pastor James McConnell made the remarks as he addressed his congregation at the Whitewell Tabernacle Metropolitan Church on Sunday evening. They were described as “very offensive”, “hurtful” and “irresponsible” by a representative from the Belfast Islamic Centre. During his sermon, the clergyman said: “Islam is heathen, Islam is satanic, Islam is a doctrine spawned in hell.” He also likened Muslims to the IRA, saying there were cells spread right across the UK. When I met her, she was enduring a crash course in politically correct Europe’s many hypocrisies. White Danes reported her to the police for writing that Muslim men abuse and murder their daughters, and adding for good measure that the ‘Koran is more immoral, deplorable and crazy than manuals of the two other global religions combined’. You could say that her remarks were offensive. You could say that the inattentive reader might just take them to mean that all Muslim men abuse and murder their daughters. But if every remark that someone might find offensive or misinterpret were banned, the human race would fall silent. 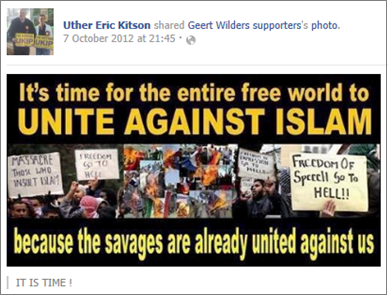 A UKIP councillor who admitted sharing offensive material about Muslims on Facebook will not face charges, the Crown Prosecution Service has said. West Mercia Police said Eric Kitson, 59, was questioned but not arrested over “concerns raised by the public”. In May a computer was seized and a property in Stourport searched for evidence. The CPS said there was “insufficient evidence” to charge the former Worcestershire county councillor. Councillors in South Ribble say they are appalled and offended after a political activist personally targeted them to ask for their support for a campaign which allegedly blames Muslims for the heroin trade. Tony Bamber has written to three councillors in the area and personally delivered a letter and leaflets under the auspices of the ‘Preston Pals’, which he says is in honour of the men of the 7th Battalion the ‘Loyals’. 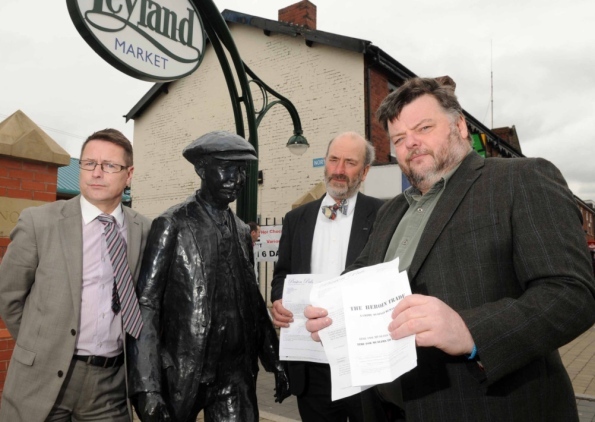 Mr Bamber is also standing in next month’s Lancashire County Council elections, as a member of the British National Party (BNP) in Burnley, and local Labour councillors are furious that he is trying to spread what they say are ‘racist views’ in Leyland. ‪The federal complaint, filed Wednesday at the U.S. District Court in downtown Los Angeles, contends that the city is discriminating against the mosque and that there is no evidence to back up neighbors’ concerns of increased traffic. 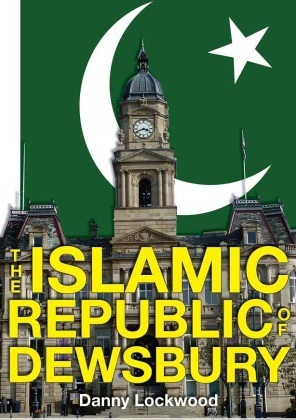 Danny Lockwood, an editor and publisher, has courted controversy by writing a book with a provocative title, The Islamic Republic of Dewsbury.